To get bigger and stronger. In my quest to achieve this goal, I read every imaginable book or magazine I could get my hands on. And of course, Muscle Media 2000. The last one really stood out, because the models in there looked amazing but weren’t ridiculously huge. And furthermore, the programs in there looked like something I could actually follow and not kill myself on. So when it came time to step my game up and get into supplements, following EAS and Bill Phillips was an easy choice. Plus, they had just started running their physique transformation contests, so I figured if those people were using all those supplements, then they could help me achieve my goals, too. Ah, to be young and naive again! I dabbled with numerous supplements over my college years, such as creatine, glutamine, and of course ephedra to get super amped and have a great workout. But it wasn’t until my junior year when I took an exercise nutrition class that my eyes really got opened to the supplement industry. For a class project we had to choose a popular supplement, and use peer-reviewed research to tell the class whether it was efficacious to use or not. 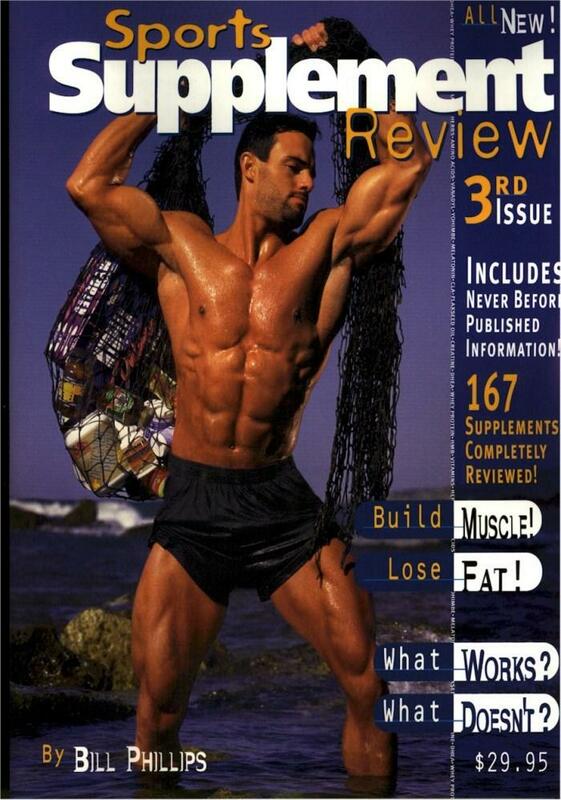 In my case I chose HMB, as it was a very popular supplement at the time. And back in my day (cue grumpy old man voice), I had to actually go to the library, find the articles in a physical journal, and copy the pages so that I could review them at home. Luckily I didn’t have to walk 4 miles, each way, in the snow, to get there! So imagine when I go through 8-10 resesarch articles, only to find that HMB wasn’t all it was cracked up to be. 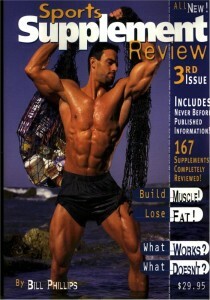 And worse, the articles that support the use of HMB are sponsored by supplement companies who make it? Needless to say, that changed my viewpoint on supplements forever. A question I get on a regular basis is: What supplements do you recommend to your athletes? It’s a loaded question, as there are ton of things that influence my answer. But I’ll do my best to answer below. But first, let me tell you my biases when it comes to this topic…. To be frank, I’m not a huge believer in supplements. Do some work like they claim? Absolutely. 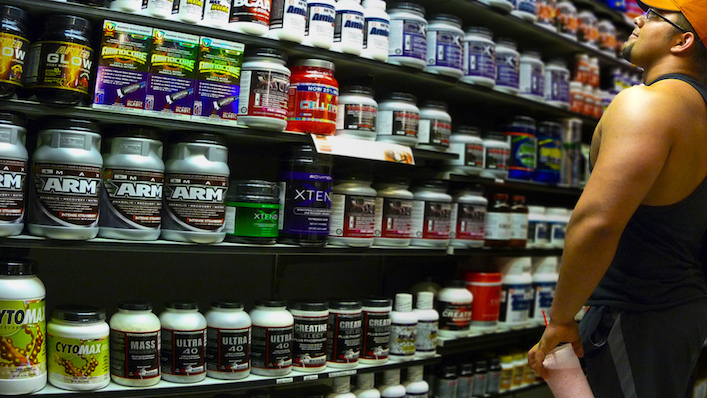 But most supplements are over-hyped, yet under deliver – which isn’t a good combination. And in my opinion, that’s probably about right. Just like when you’re lifting, your main lift is responsible for 80% of your success, so that’s where you need to spend the bulk of your energy. However, that doesn’t mean supplements don’t have a place in your nutrition and recovery program. After all that 4%, especially when applied to elite athletes, could absolutely be the difference between winning and losing. So what supplements do I recommend my athletes take? And why? I’m glad you asked – let’s get into this! Just like I have a pyramid or hierarchy for training needs, the same goes for supplements. After all, not all supplements are created equal – so why would we think of them in that manner? Foundational Supplements. Foundational supplements are almost universally beneficial, as most people could benefit from taking them. These supplements also help support general health and well-being, allowing athletes to train and recover properly. Middle Tier Supplements. Middle tier supplements have specific benefits, or are beneficial for a specific population, but their scope is a bit more narrow. Furthermore, while foundational supplements support underlying health and wellness, middle tier supplements are a bit more performance-oriented. Top Tier Supplements. 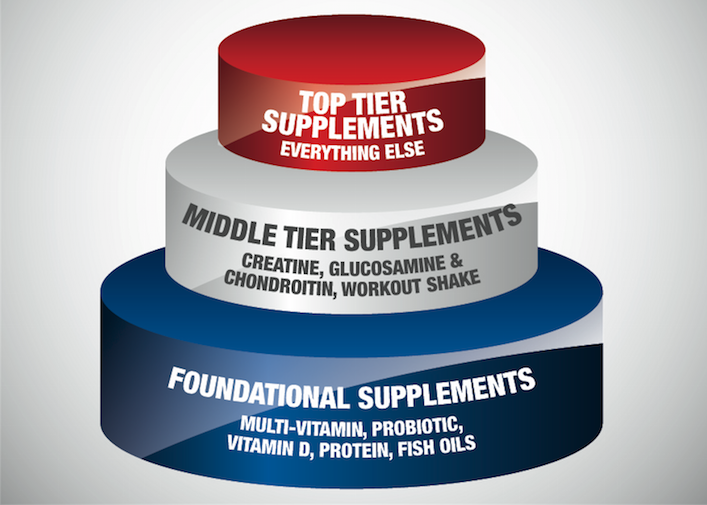 Last but not least, top tier supplements are focused on a very specific issue or goal. I won’t cover these in this article, because there are far too many supplements out there. When it comes to supplementation, I like to start my athletes at the bottom and build up from there. Foundational supplements are like the base of your pyramid. With them, you help fill in the gaps to make sure that your body is functioning optimally, and that you’re recovering in between sessions. Once your foundation is built, then you work upwards. So now that we have that covered, let’s discuss what I consider to be your foundational supplements. Multi-vitamins get a lot of flack, but I think they’re one of the safest bets when it comes to rounding out a nutritional program. I look at a multi-vitamin as an insurance policy: If you eat a well-balanced, whole food diet, chances are you may not need to take a multi-vitamin. But after reviewing food logs and diet histories for years upon years, I’ve also noticed that people who truly eat a “well-rounded diet” are few and far between. A multi-vitamin simply helps ensure that you get all the vitamins and minerals you need. The key here is to make sure that you get a high-quality multi, but that statement is also true of virtually any supplement. While probiotics have been around for quite some time, it seems as though they’ve really come to light in recent years. If you’re unfamiliar, probiotics are “good” live bacteria and yeasts that live in your gut. For lack of a more scientific explanation, many of us get too many of the “bad” bacteria built up in our gut, and as such, suffer from poor gut health. This leads to compromised immune function and digestive issues. A probiotic is a simple way to improve the balance between good and bad bacteria. Doing so should not only keep you healthy, but improve digestion and absorption of food as well. Vitamin D is another vitamin that’s gotten a ton of press in recent years. For athletes, Vitamin D is critical as it promotes both bone health and immune function. Strong and healthy bones should be a goal for every athlete, but staying healthy via a strong immune system is important, too. The issue with Vitamin D is getting enough on a daily basis. While you can get Vitamin D from fatty fish and dairy, the best natural source of Vitamin D is sunlight. In fact, some would say 80-90% of our daily Vitamin D comes from sunlight versus foods. If you’re naturally dark like me, you don’t want to spend too much time in the sun and make everyone scared of your ghostly white pallor jealous of your gorgeous tan. In this case, a Vitamin D supplement can help boost levels and get you back into the normal range. Protein is an obvious choice in my foundational supplement section. We all know that protein is invaluable for building and preserving lean muscle mass, but the issue here comes down to consumption. Most of the male athletes I know that are muscular struggle to get to a baseline level of .8 g/lb of protein per pound of body weight, let alone to 1.0 or 1.2 g/lb. * What most people don’t realize is that you have to eat a ton of whole foods to get to 200, 250 or 300 grams of protein per day! As such, a protein shake is a quick and easy way to bump up total protein intake without feeling full. This is even more obvious in the case of female athletes. Guys tend to be ok when I tell them they need to get more protein, but many females struggle with this because they don’t have the same appetite for meat, or simply don’t want to “eat” as much. A protein supplement can help ensure both male and female athletes alike can meet their protein needs on a daily basis. Fish oils are my final recommended “foundational” supplement. We all know about the negative affects of systemic inflammation in the body. Whether we’re talking about heart disease, arthritis, or a host of other potential maladies, chronic inflammation is something we should strive to avoid. A balanced approach to fatty acid consumption is critical, but supplementing with fish oils to help get an extra bump in our Omega-3 intake is helpful, too. I like seafood as much as the next guy, but getting it in more than twice per week can be challenging. As such, a fish oil supplement helps ensure we’re getting a kick start in our effort to decrease systemic inflammation. Middle tier supplements shift from a focus on filling in gaps or keeping us healthy, to focusing more purely on performance. There are obviously a ton of supplements we could discuss, but here are three of my favorites. What he’s getting at here is that creatine is arguably the most researched supplement of our time, and the really cool thing is that it does what it claims to do. If your goal is to build muscle, then creatine is a fantastic supplement. When it comes to creatine, the standard monohydrate works fine. You don’t need any special add-ons or anything like that. Furthermore, don’t fall prey to the hype of the “loading phase.” It’s largely a way for companies to crank up their bottom line right off the bat, and your extra creatine (like your money) go down the drain. I waivered on putting this in the “Foundational Supplements” section, because we all know how important a pre/peri/post-workout shake is. However, I could also argue that you could get your protein from other whole-food sources. Furthermore, the supplements in the foundational section are more geared towards health and wellness, versus performance. I’m not sure how much really needs to be said with regards to post-workout shakes. While the debate rages on as to the ideal time to supplement (pre, during, post), there’s little debate that sipping on some protein and/or branched chain amino acids around your training session can kick start the recovery process. Glucosamine and chondroitin are joint-health supplements that I’ve promoted for years. Ever since I had knee surgery way back in ’05, this is something that I’ve taken religiously. The two work together, but in very different ways. Glucosamine is believed to form new cartilage and repair old or damaged cartilage. Chondroitin, on the other hand, works to retain water and elasticity in cartilage, while simultaneously preventing further breakdown of cartilage. The admitted downside to glucosamine and chondroitin is that the research on it has been pretty hit or miss. For every study that supports its use, there’s another that shows little to no effect. If you have a history of joint issues, or you simply want to stack the deck in your favor in an effort to avoid joint issues in the future, I think glucosamine and chondroitin are inexpensive enough to take. After all, if they can keep me feeling strong and lifting heavy for a longer period of time, I’m willing to spend a little extra cash to help me stay there. As I mentioned above, I’m not going to spend much time here. They address a very specific need. For example if you’re deficient in a vitamin or mineral, a supplement here could help. Or if you have some sort of imbalance that a specific supplement could help, it would fit here. For marginal gainz. If you’ve done all the hard work and built a solid foundation to your pyramid, this would be the time to add in or try more fringe supplements. In my opinion, supplements are the icing on the nutrition cake. But having a supplement hierarchy to work from will help you make the most informed decisions for both yourself and your clients/athletes. As trainers and coaches, we need to have a basic modicum of knowledge when it comes to supplements, because this is something our clients will always ask us about. If you want to become more informed, I’d highly recommend checking out the Supplement Review Guide from the guys at Examine.com. This is quite simply the most robust and all-encompassing guide I’ve ever seen on supplements. And the best part? It’s all unbiased. 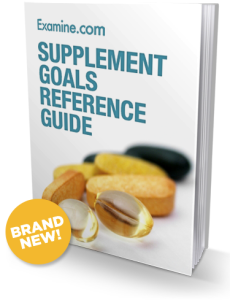 If you want or need to learn more about supplements, or simply want an awesome reference guide that you can refer to, then definitely pick up a copy today. Mike, take a look also at spectracell laboratories if you haven’t already. They offer micronutrient testing and from a blood sample can create a custom recommendation for supplementation based on what a person shows to be deficient. It’s a little pricey but for someone who wants to be very specific I thought it was pretty interesting. http://www.spectracell.com. I don’t work for the lab by the way…I did recently get results back and it was interesting to see. I’ll have to report back on what changes if any I notice once I start my custom supplement program. What is your opinion on green supplements? Great post Mike. Couldn’t agree more. A greens supplement might live somewhere in the first two tiers (I don’t use one, but it’s not a bad idea), but all in all a fantastic piece. Thanks Brian – makes me feel a bit better that someone like you approves! I was a little uncomfortable writing this as it’s outside of my normal comfort zone, but I really appreciate the kind words. Thanks! I heard that Glucosamine should be taken separately from Chrondroitin and should taken about six hours or so apart from each other. Anyone else hear this? There may be some basis to taking them separately, although it would make the dosing schedule pretty annoying. Taking the glucosamine+chondroitin combo reduces the plasma concentration of glucosamine, when compared to taking glucosamine alone. This is not widely known for some reason. Have you heard of #Shatter SX7; I recently obtained a few samples from GNC when I made a visit there. I decided to take this because I was up late the night prior and really needed an extra boost for my workout. I couldn’t believe the amount of energy etc., it provide; I tore up the gym. Shortly after taking, I had some tingliness in my hands and top of head; was a weird sensation but went away mostly after I started to work out.